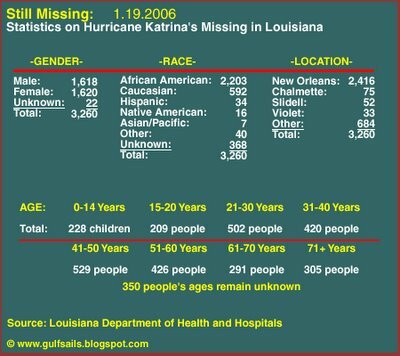 According to the Louisiana Department of Health and Hospitals, nearly five months after Hurricane Katrina made landfall, there are still 3,260 people listed as missing. Not as unidentified remains, but of missing. Of course some relatives have failed to check back in to alert LDHH that they have discovered their loved ones whereabouts, but that cannot account for more than say half. Someone please explain to me as to why FEMA can't simply check this list against who they mailed disaster relief aid out to and solve some of these issues. I tried to research how long it took the Feds to track down the missing after 9/11, but never dug up any true numbers... I'm pretty sure that this was a top priority though. The two that really jump out at me are that the vast majority of the missing are African American, and the other one that gets me is that 228 children missing number. Sure seems that 228 children missing would fill up the sides of some milk cartons. Ah, but who cares? We've already thrown a bunch of money at the problem - time to move on to the best and worst dressed at the Golden Globes. We once heard Government "agents" shot and dumped the bodies of 2000+ criminals during the aftermath of Katrina. Haven;t seen much about this lately. It's likely that the vast majority of those missing are simply displaced. The nature of the flooding in New Orleans was not the type to wash away victims. Except for those areas immediately adjacent to the breaches, the water simply rose rather quickley and then receded slowly. This was not the type of flooding that would wash-away victims.